The JOIDES Resolution takes core samples and measurements from under the ocean floor, giving scientists a glimpse into Earth's development and a scientific means of measuring climate and environmental change throughout much of the planet's history. Image courtesy of IODP. Preparations are under way in Victoria, British Columbia, for an international marine research expedition to investigate the role of the Bering Sea in climate change. IODP Expedition 323 (Bering Sea Paleoceanography) is led by co-chief scientists Christina Ravelo, professor of ocean sciences at the University of California, Santa Cruz, and Kozo Takahashi of Kyushu University, Japan. The JOIDES Resolution, a newly equipped and modernized scientific ocean drilling vessel supported by the United States, is docked in the port of Victoria as it readies to embark on the nine-week expedition of the Integrated Ocean Drilling Program (IODP). While the research vessel is in port, approximately 100 undergraduate oceanography students from both the University of Victoria and Royal Roads University--prospective future participants in the IODP--will come aboard to inspect new laboratories, see how scientists work in the field, and learn the inner workings of an actual research drillship. Canadian researcher Taoufik Radi, a paleontologist and professor at University of Quebec, Montreal, represents Canada's marine research interests among the international group of research scientists on the expedition. IODP Expedition 323 aims to extend the research findings of the 2004 IODP Arctic Coring Expedition (ACEX 302), which drilled and collected sediment samples from the Lomonosov Ridge in the central Arctic Ocean. Since that investigation's conclusion, the scientific community has anticipated acquisition of new geological cores and data that address the age and effects of the Bering Strait gateway to the Arctic. "The Bering Sea drilling plan is essential to our ability to decipher the history of the Bering Strait gateway and determine its impact on global and regional climatic and oceanic processes," Ravelo said. "New cores will help us understand the exchange of heat and chemical elements running through the Bering Strait, and how those may have influenced Arctic and North Pacific environments. It also will help us understand how sea ice accelerates climate change, and how subpolar ecosystems respond to climate change." Planned drilling will allow penetration through sediments that scientists suspect date back through geological time to the Pliocene and possibly upper Miocene periods (approximately five million years ago). The drilling strategy is intended to help scientists capture important processes in the Bering Sea, including reconstruction of records related to sea-ice distribution and gradients. After an extensive modernization, the JOIDES Resolution returned to IODP operations in March 2009. Its first research investigation, the Pacific Equatorial Age Transect, was completed just prior to the ship's arrival in Victoria. The scientific interactions of 50 scientists on board the vessel from March to June are expected to make a substantial contribution to the knowledge of Cenozoic ocean history and global climate change. The JOIDES Resolution is operated for IODP by the U.S. Implementing Organization (USIO) comprised of Texas A&M University, Lamont-Doherty Earth Observatory of Columbia University, and the Consortium for Ocean Leadership. IODP is supported by two lead agencies: the U.S. National Science Foundation and Japan's Ministry of Education, Culture, Sports, Science, and Technology. 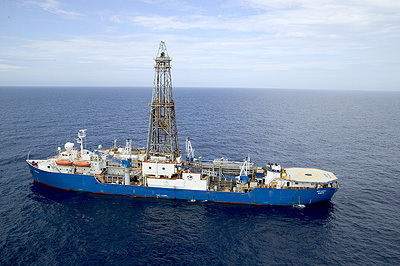 Additional program support comes from the European Consortium for Ocean Research Drilling (ECORD, of which Canada is a member country), India's Ministry of Earth Science, the People's Republic of China (Ministry of Science and Technology), the Republic of Korea (Korea Institute of Geoscience and Mineral Resources), Australia and New Zealand (Australian-New Zealand IODP Consortium). IODP's principal areas of research are climate and environmental change, solid Earth processes, and the deep biosphere.